This is a CMS coded from ProjectCMS.net and its not finish yet, but we will give you all necessary information in this Thread. The Thread will be updated on any changes to keep you, the users informated. 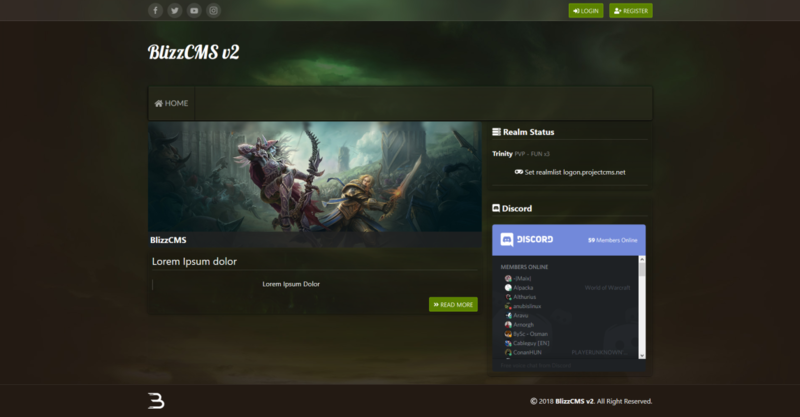 The work on BlizzCMS v1 has stopped due personal choices and the team want to build it up new just to make the code more stable, and this is the result. First some informations and differents between the versions. Framework - We build BlizzCMS under Uikit in Front-End and Codeigniter as Back-End Framework, we notice that this give us better progress and better development. Code - Build up the Code from Zero, with more structure to give the CMS more Balance and reduce the time the pages needs to load. Some modules you will have to pay for. What did our developers say to our new Forum? What have we done to remedy the lack of these features? In V2 we wanted to fix all this, improve it and bring it to the community. First, we have rewritten the way of acting of our forums, the way of storing the data is much more effective and orderly. Not only is sending a post and receiving it in the Database, now all this receives much more information, and everything is working from a single table. The design has also received a facelift, following our standards we wanted to capture a responsive design. Although the design is not the only thing we have wanted to improve, since paying attention to your feedback we have added new features, which I will tell you next. In general REST APIs are very useful when we want to interconnect applications of different technologies such as CodeIgniter with Android, IOS … in a supposed case of having a centralized management application with CodeIgniter and the Android application makes queries through the REST API, this would be one of the most common scenarios due to the great reach that mobile applications have today. Here you can see the change logs, you are able to make it very structured and easy to use. More information in the progress log below. We thanks any users for supporting this project. Please be friendly and respect the others. But please be aware, this repository and issue list belongs to the v1. We keep the thread up to date on every change, so you will know it first when the code is ready to release. Be patient and keep watching this thread. Change the Progress from the Module "Forum" from 90% to 100% ( Working ) // it would be necessary to add some extra features to moderate. Alter table "Users" and added two new columns "thread" and "replies"
So our devs working hard on the development, we are planning to bringt the first test-release soon. We change the structure of the changelog so there you are able to structure your changelog for your user better. You can pick the single classes or Npcs by creating a changelog but this only for example. You can see it it the pictures above. Working on the forum module. Implement a feature that shows last threads posted by staff. Excuses for the last mounth without any updates here, the team keep up the work, but due the release of battle for azeroth we invest more time in other things. What is required to join the alpha? - A server with what is necessary for any web. More Informations in our Discord channel, join us. Here just a small preview. The forums work perfectly with the ACP, but you are working on a less difficult permissions system for the forums. Currently we are fixing all the reported failures. And that currently, we are fixing all the reported failures. Due to that, the development has been delayed. As already mentioned in the thread, if they make the old version that way they want to, it needs longer as build it up new. May we don't talk from a new project. We only talk about a new version. It's normal to make a new version, to realise the goals better and with a faster progress. I gonna understand you if we are saying okay, we stop working on the blizzcms and start working on an own emulator. But we don't do it, so I can't agree. But nethertheless, thanks for your feedback. Last edited by Heimdall; 08-10-2018 at 04:23 PM. Looks awesome, keep up with good work. Please also fix a Vote Shop because this does not work in the first version. Please be patient. 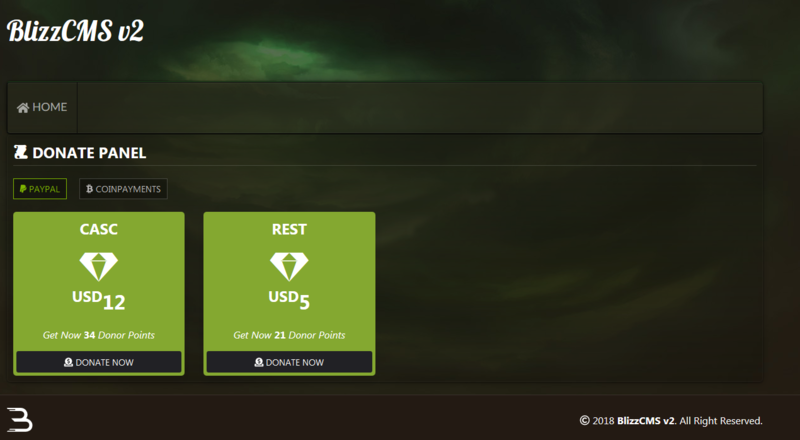 We worked on the site of Projectcms to make better performance for BlizzCMS V2. Last edited by Mordoth94; 08-22-2018 at 06:11 PM.